Millions of Americans each year are injured in car accidents. Car accidents are also the leading cause of brain and spinal cord injuries, neck and back injuries, orthopedic injuries and neurological injuries. Due to the fact that car accidents occur on Alabama roadways with great frequency and can result in significant injuries, it is not a surprise that they are often the subject of personal injury claims and lawsuits. In fact, car accidents typically represent the largest percentage of civil injury cases pending in courts. If you have been injured in a car accident that was the fault of another, you have specific legal rights. However, in order to maintain those rights and preserve the evidence associated with your accident, you cannot afford to delay. The car accident attorneys at Hollis Wright are ready to fight for you and obtain the compensation that you deserve. Realize that soon after a car accident occurs, the insurance company for the at-fault driver is hard at work gathering critical facts and evidence in order to establish a defense to your claim. 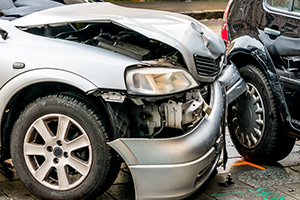 A car accident insurance claim often involves two or more insurance companies—your insurance company and that of the person that caused the accident. The insurance companies have experienced adjusters and attorneys looking out for their interest. Injured victims need, and are entitled to, an aggressive advocate looking out for their interest as well. A car accident claim can be overwhelming, time consuming and confusing. Injury victims may face lost wages, high medical bills, repair bills, and other out-of-pocket expenses and damages. It is important to have a qualified car accident attorney in your corner to make sure that a proper and timely investigation is conducted, that the insurance benefits are coordinated, and that you, as the accident victim, are reasonably compensated for your injuries. Most states allow those who have suffered personal injury to recover damages for medical bills, lost wages, pain and suffering, emotional distress, mental anguish, disfigurement, scarring, permanent impairment and other general damages. Some insurance policies allow for med-pay, which is a type of no-fault insurance to help pay for medical treatment. An Alabama car accident attorney at Hollis, Wright, Clay & Vail, P.C. can help evaluate what benefits are available to you and obtain those benefits on your behalf. If you or a loved one has been injured or killed in a car accident, please contact the Birmingham car accident attorneys at Hollis Wright for a FREE and confidential case review and consultation. Don’t let the insurance companies take advantage of you. Call us toll free at 844-529-8255. Please click here for a list of the Alabama cities and geographical areas that the Hollis Wright car accident attorneys serve victims of automobile accidents.